It was an evening of creativity and completion for the Little Free Library Project. Building relationships between the future stewards of our society and those who are currently charged with great responsibility is a cornerstone of a WHSAD education. Many students take advantage of opportunities that allow them to work alongside and gain insight from professionals in various fields. Such experiences permit students to develop a greater awareness of the world outside of their daily lives and also build confidence in communicating with individuals on a more sophisticated and professional level. In addition to the numerous internships and career-oriented opportunities the school has developed over the years, WHSAD’s work as a community school this year has students engaging in projects that serve area needs. 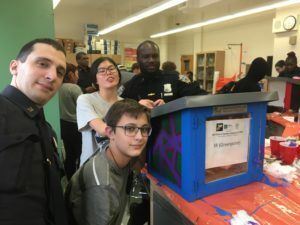 On Wednesday, March 28th WHSAD students and staff along with police officers from various districts throughout Brooklyn came together for the culmination of the Little Free Library Project. 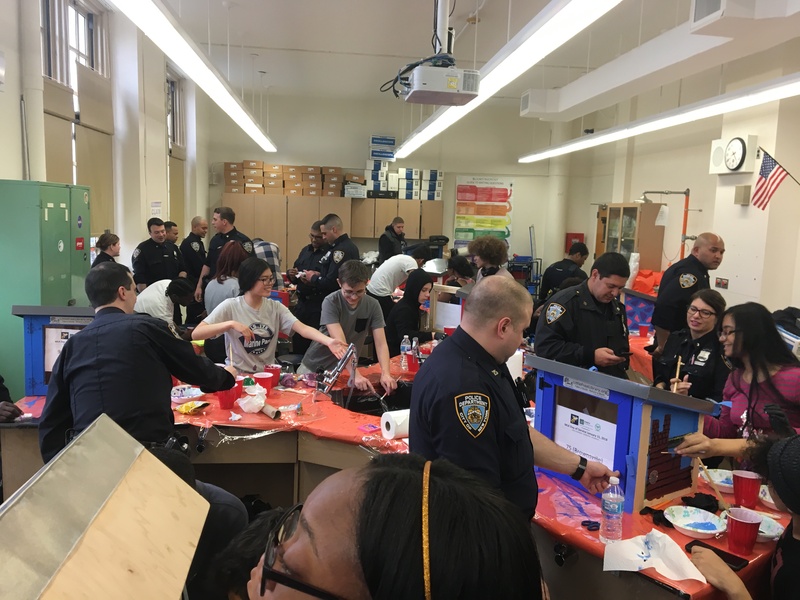 Beginning on Martin Luther King, Jr. Day, the project had students and police officers working together to craft wooden boxes to hold books for area residents to borrow. These boxes will be placed at various precincts throughout Brooklyn with the aim of bolstering community literacy. 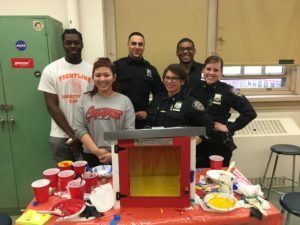 Throughout the course of the process, students gained community service hours, exhibited their creativity, and sharpened their social skills. 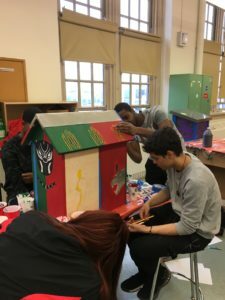 Below, teacher and WHSAD Community Service Coordinator Sandra Spaziani and students Guadalupe Hernandez and Adrian Sterling share their thoughts on the the project and its final day. 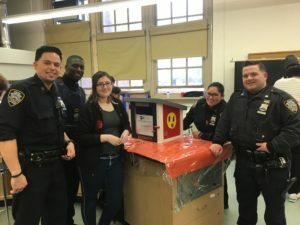 On Wednesday, March 28th, NYPD from 10 different districts came to WHSAD and participated in the second half of our Little Free Library Project. 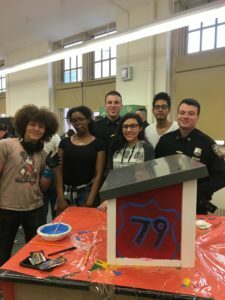 The goal was to get the 15 libraries, which the police officers and students had built, painted and ready for display in the different police precincts. 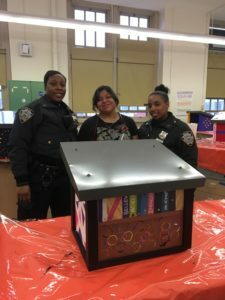 Students and police officers worked in groups of three or four to paint individual libraries. They chose the design and colors themselves and worked together to complete each one. It was a great opportunity to bring the two groups of people together in an environment where they could learn about each other as people rather than as their occupation of ‘police officer’ or ‘student’. Assistant Chief Jeffrey Maddrey attended and the students and he worked together on a library with a special Black Panther theme. Each library will serve as a place where people can find books to read and share their favorite books with others to enjoy. On Martin Luther King, Jr. Day the community service event to create the Little Free Libraries was held here at Williamsburg High School for Architecture and Design. 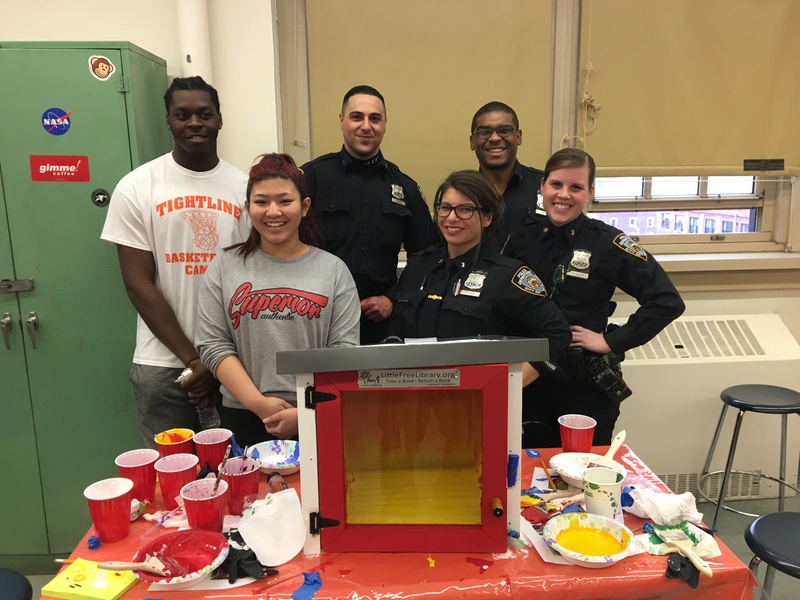 Both students and local police officers attended the event, which first started off with breakfast where we, the students, got to interact with officers before the workshop. When my friends and I introduced ourselves, the officers were all interested as to why we would come out on a day school was closed. Our response to this was that we wanted to help make these libraries as we thought they would be very helpful. The workshop started, and we discussed the reason for the Little Libraries. It was to help make reading material more available in areas in our neighborhoods. The instructor then gave us information on the icebreaker we would be doing in our groups. Our groups consisted of two officers and two students. In our groups we answered what the correlation is between young people being put in jail and illiteracy. The officers I was paired up with were very helpful in aiding us in coming up for reasons as to why illiteracy may lead to individuals to be put in jail. We were able to communicate effectively on the subject. As we proceeded to make the library, I was able to take a lead in using the drills. It was a lot of fun working with the officers. When we came back to paint them, it was so great to see the officers again. It was so much fun creating unique designs on the Little Libraries. It was such a great activity since we were allowed to create whatever designs we wanted in our groups. Each of the Little Libraries was greatly different from each other. There was one painted like a house with flowers, one had polka dots, and the largest one was Black Panther inspired. It was such a great way to give back to our community and meet our New York City Police Officers. The painting of the mini libraries for community service with police officers was a fantastic experience! I expected there to be an abundance of police officers and a small group of students working on the libraries, but to my surprise, there was a large amount of both parties in the lab. It was a little overwhelming at first because I hardly recognized anyone, but then I spotted a police officer with whom I had previously worked. We exchanged a few words and caught up, which by itself was a memorable experience. Once we finished our conversation, I remembered that I had work to do. So I found my group of Skills USA members and got to work on painting the convenient libraries we created for the youth of New York City. While I was painting I had a relaxing sense of security. Not only because half of New York City’s police force was around me, but because I was doing an engaging and relaxing activity while socializing with my friends in the comfort of my school. I completely forgot that I was doing a community service activity, and I thought that I was doing a hobby with all of my friends. The police officers added to the mix was a nice touch because it reminded me that they are human too. They breath the same air and experience the same ambience, and they took the opportunity to better their community in a different way. That opened my eyes to a completely new perspective of the life of an officer. They are New Yorkers. Like me.